<?xml version="1.0" encoding=shift_jis"?> <!DOCTYPE html PUBLIC "-//W3C//DTD XHTML 1.0 Transitional//EN" "http://www.w3.org/TR/xhtml1/DTD/xhtml-transitional.dtd"> <html xmlns="http://www.w3.org/1999/xhtml" xml:lang="en" lang:="en" > <head> <title> Perspectives in Nuclear Fission </title> <link rel="stylesheet" href="style.css" type="text/css" /> <meta http-equiv="Content-Type" content="text/html; charset=shift_jiis" /> </head> <body> <img src="Logo2.jpg" width="500", height="80" /> <br /> <br /> <!-- <img src="Sunrise.JPG" width="145" height="109" /> <img src="Jinja.JPG" width="165" height="109" /> <img src="Ricefield.JPG" width="145" height="109" /> <img src="Kokuson.jpg" width="172", height="109" /> --> <img src="Ume_White.jpg" width="145" height="109" /> <img src="Kairaku_En.jpg" width="349" height="109" /> <img src="Ume_Red.jpg" width="145" height="109" /> <img src="Kokuson.jpg" width="172", height="109" /> <img src="Sakura-Akogi.JPG" width="180", height="109" /> <h2> 54th ASRC International Workshop Sakura-2019 "Nuclear Fission and Structure of Exotic Nuclei " </h2> <h3> Japan Atomic Energy Agency (JAEA), Tokai, Japan <br /> 25-27 March 2019 <br /> </h3> <h4> Supported by Advanced Science Research Center (<a href="http://asrc.jaea.go.jp/asr_eng/index.html" target="_blank">ASRC </a>), JAEA <br /> </h4> <h4> Organized by the Research Group of Heavy Element Nuclear Science of the ASRC ( <a href="http://asrc.jaea.go.jp/soshiki/gr/HENS-gr/index_e.html" target="_blank"> here </a>) <br /> and Nuclear Physics Group of the University of York ( <a href="http://npg.york.ac.uk/" target="_blank"> here </a> ) </h4> <p> An international workshop : <strong>"Nuclear Fission and Structure of Exotic Nuclei"</strong> will be held on <strong>25-27th March 2019 organized by ASRC of <a href="http://www.jaea.go.jp/english/index.shtml" target="_blank"> JAEA </a>, Tokai, Japan</strong>. The meeting will mainly be devoted to new experimental and theoretical achievements in fission, super-heavy nuclei, nuclear reaction and structure of exotic nuclei. Especially, our group is driving a dedicated program using the rare target material, einsteinium-254, for which new results and new proposals will be discussed. </p> <p> This is the 8th meeting in the series of workshops held at ASRC (Tokai). The links to seven earlier workshops can be found below. <br /> 2017 <a href="https://asrc.jaea.go.jp/soshiki/gr/HENS-gr/workshop8/index8.html" target="_blank"> "Workshop for Einsteinium Campaign" </a> <br /> 2016 <a href="https://asrc.jaea.go.jp/soshiki/gr/HENS-gr/workshop6/index6.html" target="_blank"> "Experimental and Theoretical Advances in Fission and Heavy Nuclei " </a> <br /> 2015 <a href="http://asrc.jaea.go.jp/soshiki/gr/HENS-gr/workshop5/index5.html" target="_blank"> "Nuclear Fission and Exotic Nuclei" </a> <br /> 2014 <a href="http://asrc.jaea.go.jp/soshiki/gr/chiba_gr/workshop4/index4.html" target="_blank"> "Nuclear Fission and Exotic Nuclei" </a> <br /> 2014 <a href="http://asrc.jaea.go.jp/soshiki/gr/chiba_gr/workshop3/index3.html" target="_blank"> "Nuclear Fission and Structure of Exotic Nuclei" </a> <br /> 2013 <a href="http://asrc.jaea.go.jp/soshiki/gr/chiba_gr/workshop2/index2.html" target="_blank"> "Nuclear Fission and Decay of Exotic Nuclei" </a> <br /> 2012 <a href="http://asrc.jaea.go.jp/fission_workshop/index.html" target="_blank"> "Perspectives in Nuclear Fission" </a> . <br /> </p> <p> Dedicated topics and/or sessions are as follows. <br /> <ul> <li> Fission-fragment mass/charge and kinetic energy distributions </li> <li> Prompt neutron and gamma-ray emission in fission, multi-chance fission </li> <li> Beta-delayed fission </li> <li> Super-heavy elements </li> <li> Heavy-ion fusion and multi-nucleon transfer reactions </li> <li> Structure of exotic nuclei </li> <li> Related topics </ul> </p> <p> <h4> Program <mark><font color="red""> New ! Program of the workshop can be downloaded . We expect the participants to arrive on 24th March. The workshop will start on Monday, 25th in the morning, and end on Wednesday, 27th in the early afternoon. 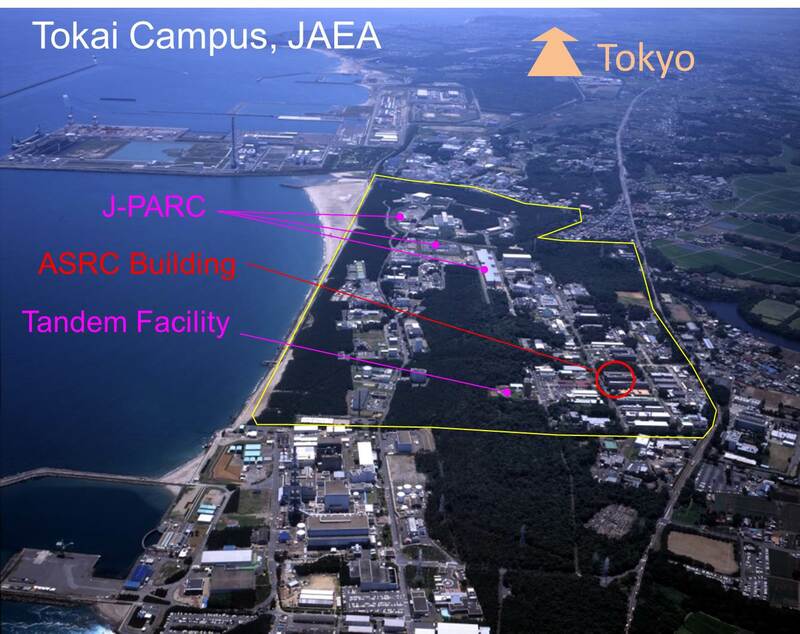 The workshop venue is changed from Head-office Building of JAEA to Advanced Science Research Center in the campus of Nuclear Science Research Institute (see photo). Map of Tokai and workshop venue can be downloaded. All colleagues wishing to join the workshop are kindly requested to fill in the Registration Form and Abstract of a contribution, and send it to organizers ( asrc-fission@jaea.go.jp ) by the 15th January 2019 . The program of the workshop will be announced by the mid-February. We ask for the workshop fee JPY 2000 per person for coffee-breaks, which can be paid at the registration desk in the morning of 25th Monday. We will have social dinner in the evening of Monday (25th) . It costs JPY 6000 per person. Participants who join the dinner are requested to pay at the registration desk on Monday morning. There is a range of hotels in Mito-city (15 minutes by the local JR train from Tokai) and Katsuta-city (8 min). Participants who wish to stay in these cities can book a hotel by themselves. A typical cost of a single room in these places is around JPY 7000-12000 per night. The Mito/Katsuta have many nice restaurants. Please, keep in mind that this period is close to the Sakura blooming, thus a busy period, hotels should be booked well in advance. The following hotels in Mito city are very conveniently situated directly at the JR/train/bus station, very close to the city centre. For those who stays in Mito/Katsuta, we will prepare a transport bus from the Tokai Station to the JAEA campus. The bus leaves at 8:20 in the morning from the East Exit of the Tokai station. Also the bus from the campus to the Tokai station will be prepared after the end of the session in each day. For the access between the Tokai station and the campus, one can also take a local bus (time table) with one-way cost of JPY 220. "Hotel Terrace The Garden MITO" . "Daiwa Roynet Hotel MITO" . Participants can also stay at the "Masago International Lodging", which is located at the ~15 min walk distance from/to the workshop venue. It costs about ~JPY2000 per night. One can take a taxi (cost ~JPY 2,000) or local bus (time table) from the JR Tokai station to the lodging with one-way cost of JPY 260. Information and map of the lodging can be downloaded . Also, it is a few minutes walk to the Akogigaura Kouen, a famous park with many Sakura trees. We are keeping several rooms, but there is a limitation. Those who want to stay here can send your request for the lodging in the registration form. NARITA/TOKYO is the most convenient international airport. The easiest way to come to the Mito-city and/or Tokai is to use the "Shuttle Bus" Shuttle Bus (JPY 3,100), which stopes at the "Mito Station (South Exit)", "Katsuta Station (West)", and "Tokai Station (East Exit)". For a return trip, one need to book a bus in advance, see "how to purchase". Please contact to our secretary to help booking. HANEDA/TOKYO international airport is also available. Map of the Tokai Campus can be downloaded. Map of Restaurant at Tokai can be downloaded.